Microdermabrasion helps rejuvenate the appearance of your skin. Aesthetic skin flaws can cause patients to be embarrassed or self-conscious. Microdermabrasion is a non-invasive, chemical-free treatment that can address skin imperfections such as sunspots, clogged pores, and acne scars. To perform this procedure at our Pittsburgh, PA, practice, Dr. Julio Clavijo-Alvarez will use a gentle spray of microcrystals to remove the outer layer of skin and reveal healthier-looking skin below. About Microdermabrasion treatments in Pittsburgh, PA.
Microdermabrasion is gentle, all-natural, and it is effective for all skin types. In addition to treating skin blemishes, this treatment simultaneously encourages the body’s own production of collagen and elastin. This aids in producing thicker, healthier layers of skin. In addition to the face, microdermabrasion can be performed on other areas of the body, including the neck, back, chest, and hands. Unlike store-bought skin care kits, microdermabrasion treatments are incredibly gentle, and can help protect your skin from irritation. Each layer of dead skin that is exfoliated will give way for healthier elastin- and collagen-rich skin cells. For this reason, most patients will require more than a single treatment to achieve the desired results. Typically, a total of five to 12 treatments are performed one to two weeks apart. When multiple treatments are performed, it can result in a brand-new layer of skin cells that will give you a fresh and healthy glow. 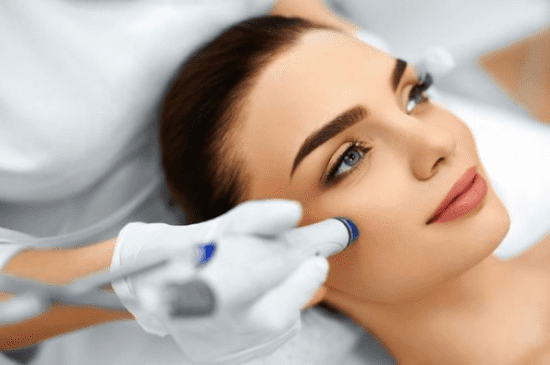 Who is a Candidate for Microdermabrasion skin care? It is important to understand that microdermabrasion is not intended for the treatment of certain conditions, such as active acne, sagging skin, or deep creases. Patients who desire to address these issues will be better suited for alternative cosmetic treatments. The typical cost for Microdermabrasion near Pittsburgh, Pennsylvania ranges from $70 - $150. Often referred to as the “lunchtime facial,” microdermabrasion can be completed in our office in about 30 to 60 minutes. During treatment, our clinician will place a hand piece against the surface of your skin. This device will deliver a stream of aluminum microcrystals to gently exfoliate the skin and clear the pores. Simultaneously, a mild suction will be used to remove the dead skin cells and debris. During this process, lymphatic flow will be improved, encouraging skin cell regrowth and renewal. Most patients experience little to no discomfort throughout the treatment. In fact, many people liken the sensation to a warming facial massage. Unlike store-bought skin care kits, microdermabrasion treatments are ultra-gentle, and can help protect your skin from irritation. Following your treatment, your skin may appear pink or reddish. This will likely subside over the next few hours. Most patients return to work right away, as microdermabrasion requires zero downtime. It is important, however, to apply a facial moisturizer to soothe and hydrate the skin. Sunscreen should also be worn, and direct sun exposure should be avoided. In addition to these cosmetic benefits, microdermabrasion is also more cost-effective than alternative treatments. Because this is a non-invasive procedure, routine touch-ups can be performed to maintain your new refreshed, youthful look. If you are looking for a non-invasive, chemical-free method to exfoliate your skin, microdermabrasion could be the solution for you. To schedule an appointment with Dr. Clavijo-Alvarez, contact us online or call our office at (412) 638-2391.